GH3C-285 | Size: 50 ml / 1.69 fl.oz. 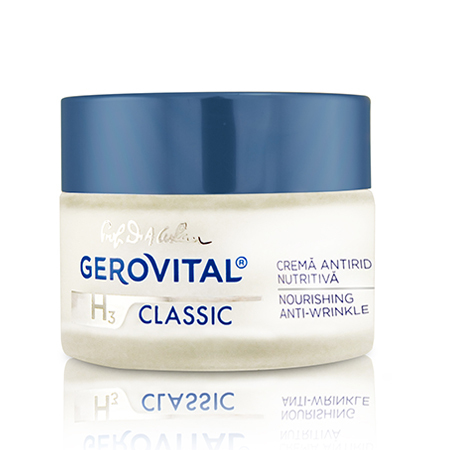 Acting at night, when the skin’s ability to repair itself peaks, the cream revives cellular metabolism, reduces visible signs of skin aging and boosts defense mechanisms against free radicals. With the Anti-Aging Complex H3 (Hyaluronic Acid combined with Vitamin E and Juvinity™), it provides the skin with essential nutrients and enhances its ability to repair and regenerate overnight. • Elasticity increased up to 77.8%. INGREDIENTS: AQUA, GLYCINE SOJA OIL, PETROLATUM, LANOLIN, SORBITAN OLEATE, GLYCERIN, CERA ALBA, BUTYROSPERMUM PARKII BUTTER, TOCOPHERYL ACETATE, CAPRYLIC CAPRIC TRIGLYCERIDE, HYDROGENATED CASTOR OIL, PARFUM, PHENOXYETHANOL, MAGNESIUM SULFATE, ZINC STEARATE, STEARIC ACID, BENZYL ALCOHOL, STEARALKONIUM HECTORITE, GERANYLGERANYLISOPROPANOL, POTASSIUM SORBATE, METHYLPARABEN, PROPYLENE CARBONATE, TETRASODIUM EDTA, SODIUM HYALURONATE, BHA, ETHYLPARABEN, PROPYLPARABEN, BUTYLPARABEN, TOCOPHEROL, SODIUM HYDROXIDE. It's so oily that I do not get my face dry especially during cold winter season.